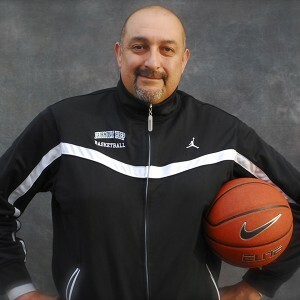 Pete Rivas, founder of The Works Basketball Academy, brings an impressive basketball teaching resume and over thirty years of coaching experience to his Nike Basketball Camps, The Works Basketball Academies, and his worldwide training. Coach Rivas is a former Division I assistant coach and head high school coach. He currently teaches and coaches at Fairmont Preparatory Academy in Anaheim, California, where his team has won CIF Quarterfinals, CIF Finals and State playoffs in consecutive years. Last year, Rivas’ team won CIF champions and state quarters. His programs with The Works help level the playing field in an environment of elite players. Pete and his staff have trained many high profile high school programs both in and out of season. Among the many fine athletes he’s worked with, Pete has trained players currently attending Vanderbilt, USC, UC Davis, UConn, Boise State, LMU, and Iowa State to name a few. Coach Rivas continues to travel and draw players from all over the world to his basketball training camps and continues to expand his camp offerings within the Nike Basketball Camp family. How long have you been coaching basketball? I started coaching basketball in 1980. Yikes, 36 years!! I’ve been directing Nike Basketball Camps since 2007. What is the key to an incredible camp experience for you? I read Leading with the Heart, a book by Coach K, and in it he mentioned that sometimes you have to throw out the practice plan. So I take that “to heart” and realize that Every camp is different. I always have the warmup and first few hours done before camp starts. But I like to get to know the kids in camp first and figure out the camp personality before I pull out any specific drills or curriculum. Your perfect camper on Day #1 arrives with what qualities? I have three types of favorite campers; The returners, the international kids that come for the American Hoop experience, and the newbies-the look on their faces when they accomplish a week of Nike Basketball Camps The Works Way is PRICELESS!! Which college or pro player do you make it a point to watch play? It’s all about team, I have no favorite players. I love watching the Spurs and Warriors. They make you want to go out and practice the game — they respect the game and each other. It shows in their effort and execution. What message would you like parents to understand prior to camp? Make sure their kids have plenty of water and are ready to trust the process; it’s not all about games, games, games. For more information on Coach Rivas’ Nike Basketball Camps in Anaheim and Bakersfield, CA, visit http://www.ussportscamps.com/basketball/nike/california/ or contact us at 1-800-NIKE-CAMP (645-3226).